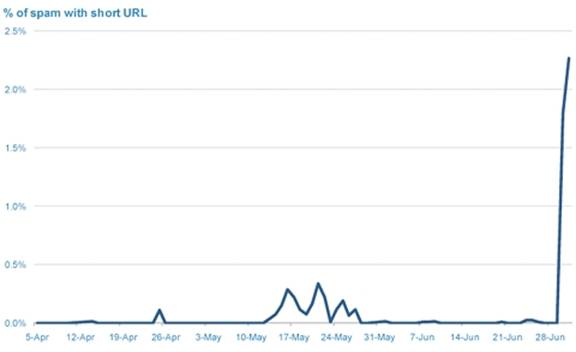 The presence of shortened URLs in spam has skyrocketed over the past few days and now appears in more than two percent of all spam, according to MessageLabs Intelligence. With many social networking sites providing character restrictions on status updates and messages, the use of free URL redirection services which turn lengthy web addresses into shortened URLs, is increasing in popularity with spammers for a number of reasons. “The newly shortened URLs also help cybercriminals disguise the true destination of where their victims will click through to, posing further risks of entering websites used to conduct drive-by malware attacks as well as spam. Donbot, the botnet responsible for sending approximately five billion spam messages every day, is one of the main culprits using this technique. Links of any size all need to be treated with caution.” Since you are a cautious Internet user, you know that, right? For more information on email security, checkout MessageLabs Solutions.